Margie Bradford is picking up the pieces of her shattered life following her husband’s death. When her cousin encourages her to make a fresh start with her teenage daughter, unsuspecting Margie takes a reading specialist job in the small town of Redemption, PA. The last person she expects to encounter is Rocket Manion, the ex-NFL quarterback and Dr. Phil wannabe who broke her heart nineteen years ago. Strangling her meddling cousin is now at the top of Margie’s to-do list. 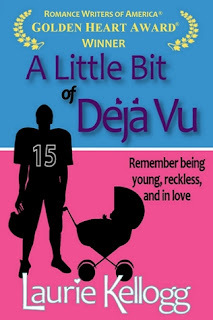 Divorced teacher and head football coach Jake Manion experiences an eerie sense of déjà vu when his son announces he’s gotten his girlfriend pregnant. The feeling simply grows stronger when Jake learns the girl’s mother is Maggie, the same woman on whom he’s wasted nearly two decades of bitterness. While planning their kids’ wedding and helping them grow up too soon, Jake attempts to pick up right where he left off—in Margie’s bed. But no matter how irresistible his kisses are, she isn’t stupid enough to let him hurt her again. Or is she? This book was a really good read. It wasn't like most romance I've read and believe me I've read a lot. I got this one free on Amazon, and I've got tons of books on my Kindle that I've yet to read, but for whatever reason this one called to me. I was pleasantly surprised when this book grabbed and held my attention, and I read it straight through after my kids went to bed. The characters are likable and realistic. Margie is trying to go on with her life after her husband dies by moving to a new town and getting a new job. Surprisingly she finds out that her first love, Jake Manion, is also living and working in the same town. Although she manages to avoid him for some time, their kids end up dating. Eventually Jake's son gets Margie's daughter pregnant right before they are due to graduate, and they are thrown together to plan their kids' wedding. The story is really believable and the plot is interesting. The story was really heartwarming and all around good. Definitely a great read.